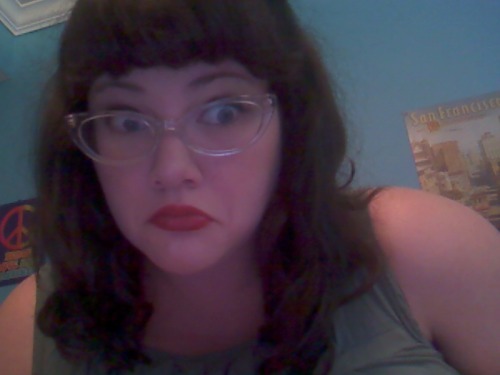 Hey, remember that one time when I updated my blog and said I'd post pictures of my new hair? The picture on the left is shortly after I had it done whereas the picture on the right is more recent. It initially looked more blue, but after a week or so it faded to a more proper green/teal. It's almost been 3 weeks since I had it done and it's holding up really well! Of course, I've also been babying the hell out if it, but y'know. Bleached and dyed and cut by Wendy at Kaleidoscope in Louisville, Kentucky. If you're in the area and looking for someone who does a good job doin' hair, I'd definitely recommend Wendy at Kaleidoscope. Everyone there is super sweet and they do a great job! Sorry things have been so quiet over here lately! My plan to be crazy productive with my updates this summer has been a little derailed by my online classes (which are, honestly, stupidly demanding). I've been writing 10 page responses and taking a 50 multiple question exam every day, so once I'm done with that I typically haven't wanted anything to do with the computer! 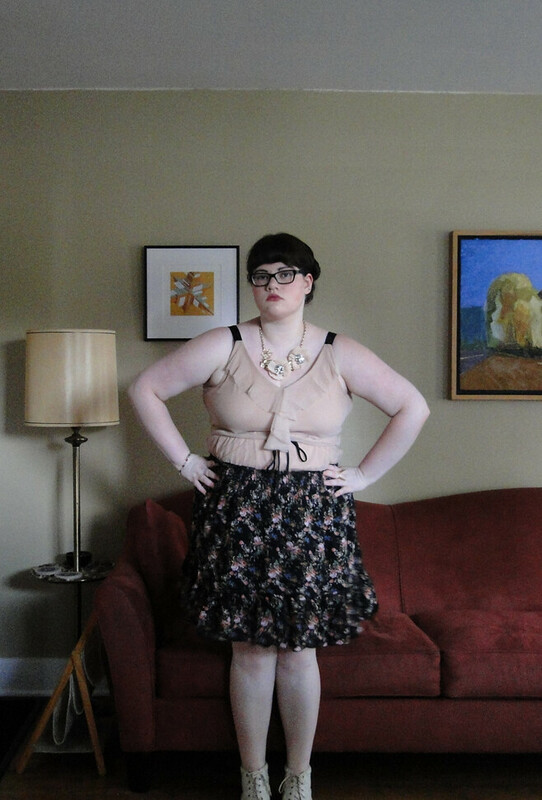 Since I last updated, I was featured in the gallery for a nifty little article on the Fatshionista Flickr group for HLN + have been planning on adding some turquoise to my mane. I have an appointment to get it cut and colored tomorrow and I am. so. excited. I'll definitely post with how that turns out soon! Boots are thrifted from RePets. 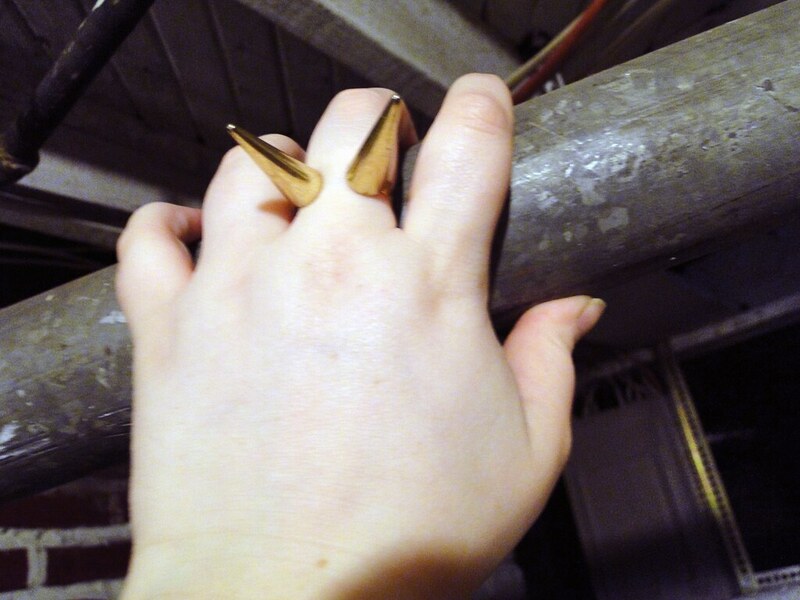 Gold spike ring is c/o Chubby Cartwheels! Say rest in peace to this background! Because I'm moving in a week. Whomp whomp. I am very much in love with this ring that I won in a contest held by the talented Shawna from the lovely Chubby Cartwheels! Seriously. This ring is unlike anything I've ever seen before and it is surprisingly comfortable (and totally badass!) 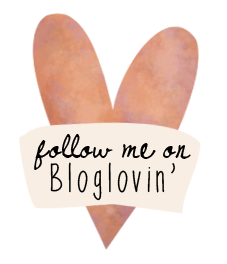 Check out Shawna's stuff, y'all, because it's kind of excellent. Hopefully I'll have another post up soon! Assuming moving... and getting things together for my birthday party on Saturda... and my online class doesn't kill me softly in the meantime.